Send a photo of your finished coloring book page to submissions@feralhouse.com. We’ll feature your work on our social media, and you’ll be entered to win a monthly drawing. What will you win? One copy each of the next coloring books in the series, Muhammad Ali- The Greatest Coloring Book of All Time and Prince- The Coloring Book when they are released in summer of 2017. 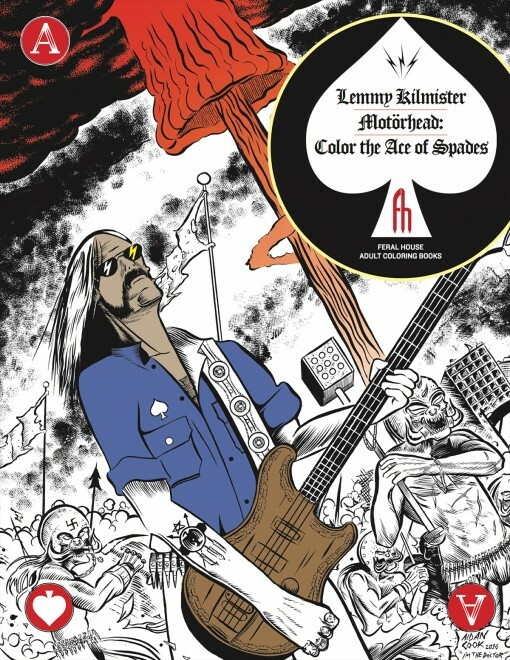 This adult coloring book about the recently deceased rock legend Lemmy Kilmister, famous for his hard metal and hard living, features drawings from many of his fans as well as many personal stories of the guitarist and vocalist’s life and work with the bands Hawkwind and Motörhead—and the liters of whisky he consumed at West Hollywood’s famous Rainbow Bar. Included in the book is work by Joe Petagno, who painted the cover of Motörhead’s renowned Orgasmatron album.